A quite ambitious project, to release a 5-CD box with a 30-page booklet of several performances by the Peter Brötzmann Tentet, with addtional performances of the Tentet members in various line-ups. The performances were recorded in Oslo, in February of 2009. The tentet assembles the absolute crème-de-la-crème of today's free jazz, led by the ferocious German. Listening to the tentet by itself may be a hard nut to crack for any unprepared listener, but five CDs could even be too much for the most fervent adepts of the genre's wildest line-up in history. It's hard to give a general appreciation for eight quite different line-ups, ranging from the minimal duets to the full-blown orchestra. Here it is : the Tentet, it must be said, is magnificent: wild, predictably unpredictable, raw, overwhelming, gargantuan, energetic, forceful and any other adjective that fits in this kind of thesaurus. But it is absolute fabulous fun for the lovers. You can laugh because of the sheer power and chaos, but the musicians are clever enough to vary with slower, often moving and sensitive moments, giving both artists and listeners a break before all hell breaks loose again. 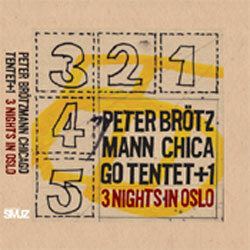 Sonore, on disc two, with the three saxes of Mats Gustafsson, Peter Brötzmann and Ken Vandermark, performs two tracks. The playing is hard and intense, and calm. Gustafsson is great. These are followed by a long drums duet by Zerang and Nilssen-Love, not really my kind of thing: nice to listen to once, but then you wonder why you would listen again. Disc two ends with a duet between Johannes Bauer on trombone and Per Åke Holmlander on tuba. The improvisation has its sensitive, fun and sonic adventure moments, with a round of applause in the middle, or is it actually two pieces? Disc three continues with duets, starting with Joe McPhee and Ken Vandermark, who play an absolutely stunning improvisation, it is fragile, deeply emotional, with Vandermark adding a kind of intimate rhythmic underground for McPhee's weeping phrases. The next piece is full of wild chattering between both virtuosi, a raw dialogue full of exciting expressivity ending in unison blues. The next duet is the trombone/drums dialogue between Jeb Bishop and Paal Nilssen-Love. Somehow it fell flat after a while, or I just could not keep my attention going. The fourth disc starts with Joe McPhee's Survival Unit III, with Fred Lonberg-Holm on cello and Michael Zerang on drums. The nice thing about this trio is the combination of McPhee's spiritual playing with the totally "out-there" sounds that the electronically-modified cello makes, but Zerang's unusual soundscrapings and unpredictable percussions add much to the overall texture. The overall effect is one of attraction and repulsion at the same time: it is full of dissonance and weirdness, but also warm, very warm. The next three pieces are played by the Trombone Choir, with Joe McPhee, Per Åke Holmlander, Johannes Bauer and Jeb Bishop, with the first one on pocket trumpet. The concept is great, and the band has it absolutely great moments, especially in the slower parts, on which multi-layered tones manage to create a beautiful and coherent whole. It works less well in the chaotic moments, but I might have to listen to it a few more times before appreciating it fully. The box ends with two more improvisations of the Tentet on the fifth disc. The first of those is again a full power blow-out session, but the second is strangely cautious, with small sounds erupting from the instruments almost without any clear intention to do so, gradually building the intensity and when you think it will explode into full blast again, you are wrong, because McPhee starts blowing a bluesy line, boppish and mild, bringing this great album to a warm closing. In general, a treat for the afficionados, and possibly a good introduction to the various styles and approaches that the same musicians can have with the same sub-genre of free jazz. It adds nothing new though to the already broad catalogue of the various bands. And 28-30 October they are at it again at Victoria, Nasjonal Jazzscene in Oslo! New box next year I guess. Man, I wish I lived in Oslo. Unfortunately, the Okka set is "temporarily out of stock". Interesting change in drummers between the two sets. Hamid Drake on the Okka vs Paal Nilssen-Love on this one.